Sina.com.cn, China’s fourth most-popular web portal, yesterday launched Sina Bitcoin Market information pages with charts, statistics and real-time market quotes. Sina announced the launch by saying the service was created to assist investors in understanding and discussing bitcoin market trends and relevant market knowledge. It features data gathered from Mt. 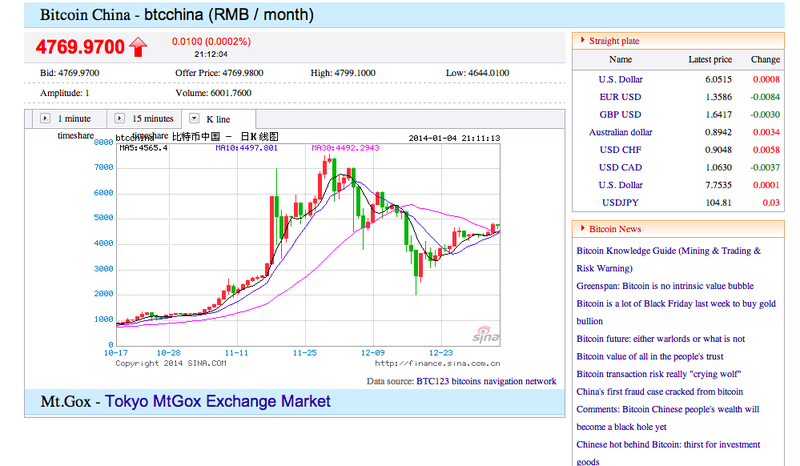 Gox (USD-BTC), BTC China (CNY-BTC), and 11 more of the largest bitcoin trading platforms. It said the site aimed to be easy to use and understand, and welcomed user suggestions. Initial reports said the response from users was mainly positive. Sina is sometimes called “the Yahoo! of China”. Given the nature of large online and media businesses in China, any sign of bitcoin endorsement from a company as prominent as Sina can spark optimism. The same signs were noted after state media CCTV’s documentaries on bitcoin earlier in 2013. It suggests that decision-makers at some levels of China’s official hierarchy appear to find value in bitcoin. Although based in mainland China, Sina’s online services are aimed at Chinese-speaking communities around the world and it has over 100 million registered users. The company also operates properties like microblogging platform Sina Weibo, Sina.net, Sina Online and Chinese mobile carrier Sina Mobile. China has bewildered many outsiders with its regulatory statements and actions of the past month; seeming to both allow widespread access to bitcoin while simultaneously clamping down on access to entry and exit points – but not always enthusiastically. Officially, the Chinese authorities have forbidden any financial institutions from setting bitcoin prices or dealing in digital currencies, and blocked third-party payment processors from exchanges. People are still allowed to speculate and trade them, with several of the usual warnings about associated risks. The formerly largest exchange BTC China has moved to a voucher system to facilitate payments. Other exchanges like Huobi, chbtc.com and FXbtc, however, are reportedly still receiving deposits in CNY via wire transfers. The uncertainty has had an effect on bitcoin prices over the past month. Bitcoin was at an all-time high of over $1,200 on 4th December, but lost 50% of that value after the People’s Bank announcements. It has recently climbed closer to the thousand dollar mark again, but any news from a country the size of China causes fluctuations. At the time of writing, 1 BTC was trading for 4,710 CNY ($778.4) on BTC China and 4,728 CNY on Huobi.com.